explaining that there was no immediate plans for an OS update but at the D9 conference this week it was shown off. Windows 8 is set to be a new and improved touchscreen version of Windows, which takes more than a little inspiration from Windows Phone 7 – the company's smartphone OS. 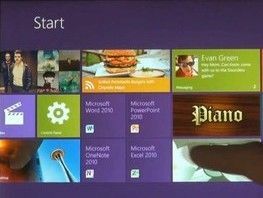 The demo of Windows 8 (which is said to be just a codename at the moment) was done on a prototype tablet and a desktop. In a release about Windows 8, Microsoft said: "Windows 8 is a re-imagining of Windows, from the chip to the interface. This "scaling" is apparent in a number of new features for Windows 8. These include many features already found on Windows Phone 7. Microsoft has optimised Windows Phone 8 for touch, but is stressing that it will work just as well with a keyboard and mouse. "The new Windows experience will ultimately be powered by application and device developers around the world — one experience across a tremendous variety of PCs." As for a Windows 8 UK release date. Well, it seems that Ballmer was right, as it looks like it will be hitting shops in 2012. To see just what Microsoft is up to, check out this video below.